This article is about the businessman and investor. For the founder of Qualcomm, see Irwin M. Jacobs. Irwin L. Jacobs (July 15, 1941 – c. April 10, 2019) was an American businessman. He was the CEO of several large corporations, formerly including the now-bankrupt Genmar Holdings, which at one time was billed as the world's largest boat-building company. He earned the nickname "Irv the Liquidator" for his aggressive business practices in the 1970s and early 1980s. In 1973, Jacobs founded COMB ("Close-out Merchandise Buyers"), a catalog-based mail-order retailer. In 1986, COMB and several cable television operators created the Cable Value Network (CVN), a pioneering television shopping channel which was later purchased by Joseph Segel's QVC. Jacobs, based in Minneapolis, became wealthy by taking big stakes in Fortune 500 conglomerates, usually with the goal of unlocking value by breaking them up. Genmar Holdings, Inc. was the second largest manufacturer of recreational motor boats, founded in 1978. It was headquartered in Minneapolis, Minnesota with offices in Little Falls, Minnesota and Cadillac, Michigan. Joseph Segel is an American entrepreneur. He is the founder of over 20 American companies, most notably QVC, an American television network, and the Franklin Mint, a producer of mail-order collectibles. Segel was named to the Direct Marketing Association's Hall of Fame in 1993. He has been honored with a Lifetime Achievement Award from the Electronic Retailing Association and an honorary doctorate from Drexel University. Jacobs was born to a Jewish family. He started his career working with his father at his business, the Northwestern Bag Company. He attended college at University of Minnesota. At the age of 33, Jacobs purchased the ailing Grain Belt in 1975 for $4.1 million with his company I.J. Enterprises. He tried unsuccessfully for eight months to turn around the company, which was losing nearly $200,000 per month at the time. He then liquidated the company, selling the brand to G. Heileman Brewing Company, and profited $4 million (The Wall Street Journal July 30, 1980). He later sold the property that accompanied the brewery to the City of Minneapolis in 1989 for $4.85 million (Star Tribune 18 February 1989). Grain Belt is a brand of beer brewed in the American state of Minnesota, by the August Schell Brewing Company. The beer has been produced in a number of varieties. Grain Belt Golden was the original style introduced in 1893. The current offerings are: Grain Belt Premium, first introduced in 1947; Grain Belt Premium Light; Grain Belt Nordeast, introduced in April 7, 2010; and the newest offering, Grain Belt Lock & Dam, introduced in 2016. It was originally produced by the Minneapolis Brewing Company which formed with the merger of four smaller brewers in 1891. Soon after introduction, Grain Belt became the company's flagship product. It was brewed at the original Grain Belt brewery in Minneapolis, Minnesota until 1976. A series of other owners followed, and Schell took over the product line in 2002. The G. Heileman Brewing Company of La Crosse, Wisconsin, United States, was a brewery firm that operated from 1858 to 1996. It was ultimately acquired by Stroh's, and its independent existence ceased. From 1872 until its acquisition, the brewery bore the family name of its co-founder, brewer Gottlieb Heileman. Jacobs' next deal netted him even more money. He read about W. T. Grant filing for bankruptcy in the Wall Street Journal and decided to purchase their consumer accounts receivable. He soon thereafter negotiated a deal where he purchased the $276.3 million account for $44 million and 5% of first years sales (The Wall Street Journal July 30, 1980). Michael Lynn, III was an American football general manager and executive. He served as the general manager of the National Football League's Minnesota Vikings from 1975 to 1990. At the time of his death Irwin Jacobs owned many businesses including: Watkins Incorporated, Jacobs Management Corp., Jacobs Industries, Inc., J.Y.J. Corp., C.O.M.B. Co., Federal Financial Corporation, FFC Realty, Watkins, Inc., Northwestern Bag Corporation, Nationwide Collection Service, Inc., 1. Jacobs Enterprises, Kodicor, Inc., Brown-Minneapolis Tank and Fabricating Co., Regional Accounts Corporation, Nationwide Accounts, Corporation, Jacobs Bag Corporation, Lawndale Industries Inc., EQC of Indiana, Inc., Touch Corporation, JMSL Acquiring Corporation, S.J. Industries, Inc., JII Air Service, Inc., P.S.T. Acquiring Corporation, Jacobs Trading, and J&D Acquisitions LLC. Hennepin County is a county in the U.S. state of Minnesota. As of the 2010 census the population was 1,152,425. It is the most populous county in Minnesota and the 35th-most populous county in the United States; more than one in five Minnesotans live in Hennepin County. Its county seat is Minneapolis, the state's most populous city. The county is named in honor of the 17th-century explorer Father Louis Hennepin. Minnetonka is a suburban city in Hennepin County, Minnesota, United States, eight miles (13 km) west of Minneapolis. The population was 49,734 at the 2010 census. The name comes from the Dakota Sioux mni tanka, meaning "great water". The city is the home of Cargill, the country's largest privately owned company, and UnitedHealth Group, the state's largest publicly owned company. Orono is a city on the north shore of Lake Minnetonka in Hennepin County, Minnesota, United States. The population was 7,437 at the 2010 census. MAIR Holdings, Inc. was an airline holding company. 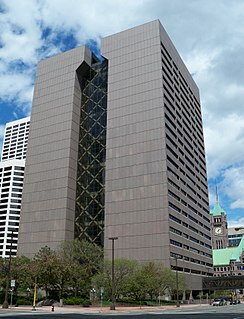 Later in its life its headquarters were in Fifth Street Towers II in Downtown Minneapolis, Minnesota. At an earlier time its headquarters were on the property of Minneapolis-St. Paul International Airport and in Fort Snelling, an unincorporated area in Hennepin County. It was established in 1993 as AirTran Corporation and was later renamed to Mesaba Holdings, Inc. The holding company served as the holding company for Mesaba Aviation, Inc., which operated Mesaba Airlines. In 2002, MAIR also acquired Big Sky Transportation, Co., operator of Big Sky Airlines. Ridgedale Center, colloquially known as Ridgedale, is an enclosed shopping mall in Minnetonka, Minnesota, a western suburb of the Twin Cities. It is directly located off I-394/US 12 between Ridgedale Drive and Plymouth Road. Ridgedale Center comprises 1,105,337 square feet (100,000 m2) of leaseable retail space, and contains approximately 140 retail tenants. It is currently jointly owned by Brookfield Properties Retail Group and CBRE Group, and managed by Brookfield. Anchors are JCPenney, Macy's, Nordstrom and Sears. The Charles H. Burwell House is a historic house museum in Minnetonka, Minnesota, United States, built in 1883. Charles H. Burwell (1838–1917) was the secretary and manager of the Minnetonka Mills Company, the first mill west of Minneapolis, around which grew the first permanent Euro-American settlement in Hennepin County west of Minneapolis. This property on Minnehaha Creek, including the house and two outbuildings, is listed on the National Register of Historic Places for its Carpenter Gothic/Stick style architecture and association with Minnetonka's early milling history. Timber Lodge Steakhouse is a privately owned American steakhouse chain with one location in Minnesota. Formerly a public company, it had eighty-five locations at its peak. Petters Group Worldwide was a diversified company based in Minnetonka, Minnesota that was turned into a $3.65 billion Ponzi scheme by its founder and CEO, Tom Petters. It had 3,200 employees and investments or full ownership in 60 companies, of which it actively managed 20, with offices in North America, South America, Asia, and Europe. Among its assets were Sun Country Airlines, Petters Warehouse Direct, and the remnants of Polaroid. Petters Group Worldwide had $2.3 billion in revenue in 2007. Thomas Joseph Petters is an American businessman and the chairman and CEO of Petters Group Worldwide who was convicted of massive business fraud in 2009 and is now imprisoned at the United States Penitentiary, Leavenworth. Amid mounting criminal investigations, Petters resigned as his company's CEO on September 29, 2008. He was convicted of numerous federal crimes for operating Petters Group Worldwide as a $3.65 billion Ponzi scheme and received a 50-year federal sentence. Abdallah Candies is a 4th-generation, family-owned chocolatier and confectionery in Burnsville, Minnesota. It was established in Minneapolis by Lebanese immigrant Albert Abdallah and his wife of Swedish descent, Helen Trovall, as the Calhoun Candy Depot in 1909. The company was renamed Abdallah Candy Company in 1916. Cargill MacMillan Jr. was an American billionaire businessman, a director of Cargill. John Sargent Pillsbury Sr. was an American businessman and industrialist known for his role as CEO at Pillsbury Company. His father was Charles Alfred Pillsbury co-founder of Pillsbury Company with his uncle John S. Pillsbury after which John himself was named. John's father had served in the Minnesota State Senate and his great uncle had served as Governor of Minnesota from January 7, 1876 – January 10, 1882. It was for this reason that John had wanted to pursue a career in politics upon graduating from the University of Minnesota. He had also planned to go to France at the turn of the century to study international law and the French language. 1 2 Businessman Irwin Jacobs, Wife Found Dead In Minnesota Mansion, Forward, April 10, 2019, accessed April 10, 2019. 1 2 John Reinan, Medical examiner confirms: Jacobs deaths are murder-suicide, Star-Tribune , April 12, 2019, accessed April 12, 2019. ↑ The Associated Press (December 17, 1991). "Two part owners of Vikings to Sell". Pittsburgh Post-Gazette. Retrieved 26 July 2012. 1 2 3 4 5 Lynn Underwood, Homegazing: Inside Irwin Jacobs' retreat on Lake Minnetonka, Star Tribune, February 22, 2014. 1 2 Williams, Brandt, "Irwin Jacobs' death ruled a suicide, wife Alexandra a homicide". Minnesota Public Radio April 12, 2019.